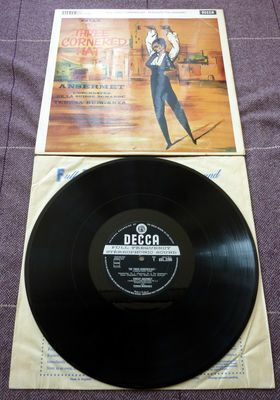 FALLA, ANSERMET, TERESA BERGANZA, THE THREE CORNERED HAT 1961 1st PRESS DECCA LP. Catalogue No. DECCA STEREO SXL 2296. WITH FIRST PRESS 1B/1B (BUCKINGHAM) stampers. This is a rare original first issue 1961 Made In England album on Black Deep Groove Wide Band Decca Record Labels with (Original Recording By) at 10 o'clock position on each record label. The LP comes in its original Blue Printed Decca Records, poly lined Inner Bag and housed in its original front laminated, Robert Stace picture sleeve with flip-backs on the back panel. Side 1 matrix, ZAL-5138-3 E & 1 B stampers. Side 2 matrix, ZAL-5139-1 E & 1 B stampers. The LP plays with a stunning sound quality on both sides. The LP surfaces and deep grooved Decca record labels are in beautiful Near Mint condition wit super clean surfaces on both sides without scratches or scuffs and at most just a couple of hairlines. The picture sleeve has a very nice Excellent condition front panel, a clean undamaged sleeve without splits or tears and with a glossy front panel with a laminate crease on the top right. The back panel of the sleeve shows light LP ring-wear and a couple of small stains and some light creases on the bottom flip-back and is in Very Good Plus condition. THANK YOU for expressing an interest in this Auction. If you would like any additional information about this item, or any of our other featured E-bay Auctions, or would like to find out more about our QUALITY Worldwide MAIL ORDER company Specialising in THE BEATLES, . Here is a Note of our Various Payment Options, welcomed in either US dollars or GB Pounds sterling. Verified users can pay us by PAYPAL, or Bank to Bank Wire Transfer, for larger transactions. We Ship WORLDWIDEwith many satisfied clients in the USA, Japan, UK and the Rest of the world - Please note that Shipping and Packaging Costs are always charged at COST PRICE ONLY - we do not seek to make a profit from shipping. All Buyers can rest assured that any purchase, small or large, will be Carefully & Professionally packaged to ensure that the item reaches the buyer in the same condition as it leaves our offices. QUALITY and HIGH STANDARDS are two of our main priorities. We promise to contact you within 48 working hours from the end of an Auction, and will process your order as QUICKLY and EFFICIENTLY as we possibly can. However, we can only achieve this with your co-operation!. After receiving the end of Auction invoice, please contact us with your Shipping Details and Payment Preference by return, or within THREE Days of Auction End. If we do not hear from you within three days, we will send you a reminder. It is our company Policy that if we do not hear from any Buyer, with their payment proposals, within TEN days of an Auction end, we reserve the right to re-list the item for Auction - We believe this to be fair - No further reminders will be sent after this time scale. RESPIGHI, REINER, CHICAGO SYMPHONY, 1960 UK RCA RED SEAL RECORDS STEREO LP.